48" x 96" x 2.5"
Utilizing photography editing with acrylics, aerosol, coffee, and other objects he feels are suitable to each piece, he delivers a concept of classic vintage inspirations and real life experiences. 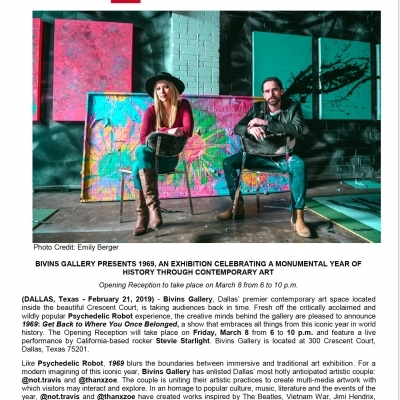 With a studio in the Dallas Design District and murals throughout Dallas’s historic Deep Ellum District, Travis has created a unique following that allows him to create one of a kind works of art along with massive mural projects throughout the city. Travis’ art origins stem from beginning photography at age 12, and then revisiting the craft while his family was living on the island of Curacao in the Caribbean. He began printing his photographs and was inspired to add to them, which is when he began to cross over in to paint and combining the two. His love of the island and its people is reflected in many of his works. He enjoys paying homage to some of the art greats, such as Andy Warhol and Jean-Michel Basquiat, while still adding his personal abstract and street art touch.